This past weekend I went to The Knit & Crochet Show in Oakland. I've been to the Stitches West show a few times now, and this is the first time I've been to another show specifically about yarn crafts (as opposed to shows that are part of county fairs). Adela's Yarns. The woman running this booth was fun and kind of a ham (the ham part showed up mostly during the fashion show, in which she was a model). I was initially drawn in because they had some really nice sample sweaters on display. (I guess you can buy them as kits.) 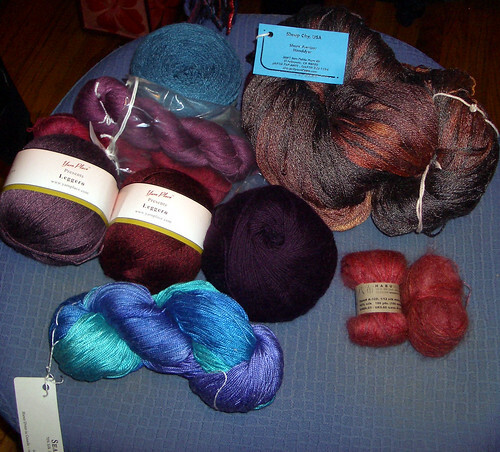 They had a lot of beautiful hand-dyed yarns by a company called Schaeffer. They also had yarn with beads already built in. However, it was over $100 a hank. Americas Yarn. This seems to be a new incarnation of Newton's Yarn Country, or at least they had a lot of Newton's yarns, mostly hanks. They were having a sale "5 skeins for $4 ea. or $6 ea. for cashmere blend" throughout the show. I was tempted by the cashmere but didn't buy any because I didn't know where it came from, and I don't particularly want to buy made in china cashmere. Argosy Luxury Yarns. They had a lot of hand-dyed cashmere, silk, and blends, and some beautiful sweaters to pet, made out of same. Fiber Elements. They had Sea Silk (which I bought) and several eco-friendly yarns such as O-Wool. Habu Textiles. I sense a new obsession coming on. If you have any interest in fiber you must go to their web site (http://www.habutextiles.com/) and/or see them at a show. They make yarn out of the usual materials such as wool, silk (dozens of different varieties), cotton, bamboo, and so on, but also out of paper, stainless steel, pineapple, recycled fishnet. (Not all of these are suitable for knitted garments, needless to say.) They also had bags of unprocessed silk cocoons for sale. I bought two tiny balls of cobweb weight silk mohair. I have no idea what I am going to do with them, but I couldn't pass them up. I enhanced my stash. This year I seemed particularly drawn to silk blends and lace weight stuff. Sea Silk "Great Big Sea"
I also won two balls of Regia Color Jacquard 4-ply sock yarn as a door prize at the dinner and fashion show (about which the less said, the better), and I picked up 2 balls of heirloom easy care 8-ply superwash wool DK for the sock knitting class. Even more gory details and photos of the yarn are on my Flickr and Ravelry accounts. JC Briar is a good, flexible teacher, and the class only had six people so we all got plenty of individual attention to the issues we wanted to discuss. She brought loads of sample socks, some of which are patterns she wrote for Blue Moon Fiber Arts sock club. I absolutely loved this class. I've seen some really ugly (too busy) freeform garments, but this method can be used to produce subtle results. It teaches a method of freeform knitting (could also use it with crochet) that produces undulating lines of color. You can use any number of different yarns as long as the colors go together. The class included a detailed handout for producing a cardigan. In class we started work on the front panel of the cardigan, which served as a sample swatch. This technique is perfect for me because I simply cannot stop myself from buying one or two balls of yarn wherever I go...and I tend to buy the same colors (blues/purples). And I don't really care for the look of "modular" stash busting garments made out of a bunch of triangles and/or squares. So if I can get this technique down, I'll have options other than producing endless multiple-yarn scarves or triangular shawls out of my stash. She also explained how to incorporate fabric into the garments, so I could even use the technique to make inroads on my fabric stash. The instructor brought a huge suitcase full of sample sweaters made from this and her other freeform styles (Personally I didn't like the other styles as well, but they were certainly impressive). She was clear, non-patronizing, no-nonsense, helpful, and confident. Also she gave us fun tidbits of gossip on why there is a "knitting magazine vs. designer" conflict. Which do you prefer toe up or cuff down? Ah, sorry. I was raised by wolves. I enjoyed seeing you and your Goldilocks Socks! lizard ridge pattern from Knitty. I've been knitting a t-shirt all summer with some annoying mercerized cotton and at Stitches West I limited myself to a few skeins of sock yarn, so I felt like treating myself to something different. Yep, the freeform thing is done with short rows and does look similar to the lizard ridge pattern, only, well, more freeform. One can only have so many hobbies before one explodes. Actually I rather like *knitting* with ordinary wool yarn. But there's not much of that to be had at knitting show markets, except the hand-dyed kind. I went in with a shopping list item for enough locally sourced worsted wool to make a sweater, but I couldn't find it. See, I have no shortage of ordinary wool yarn - I'm on the subscriber lists of Bendigo Woollen Mills, who produce 3 different kinds of ordinary wool yarns, all in about 30 different colours, and a small number of other, reasonably ordinary yarns. They have fancy (wool-oriented) yarn specials every so often, but not really of the multidyed-silk-laceweight-with-beads variety (okay, I'm exaggerating a bit :-) ). There are two other wool mills I looked into, that also make plain wool yarn in a large range of colours (they were more expensive and didn't have as large a selection, and their plain wool didn't feel as nice in the samples). The non-wool-mill producers I've tried to find in Australia didn't get around to sending me samples. I can get wool in plain colors at yarn shops or online, including North-America-grown/raised/spun wool (I made a list of producers for same - it's on my LJ somewhere back in the misty past). I just didn't find it at the market of this particular show. I love reading about your knitting. I find myself wanting to take it up, and then Disciplined Me points out that I'm already starving one of the projects I would like to be working on more (learning Chinese) to make room for the two that are dominating my life right now (singing and working on a research project for my masters degree). I need a knitting hobby like I need a hole in the head, but ooooh, pretty!